The Empress is your Balance In Creation. From Rachel Pollack: “. 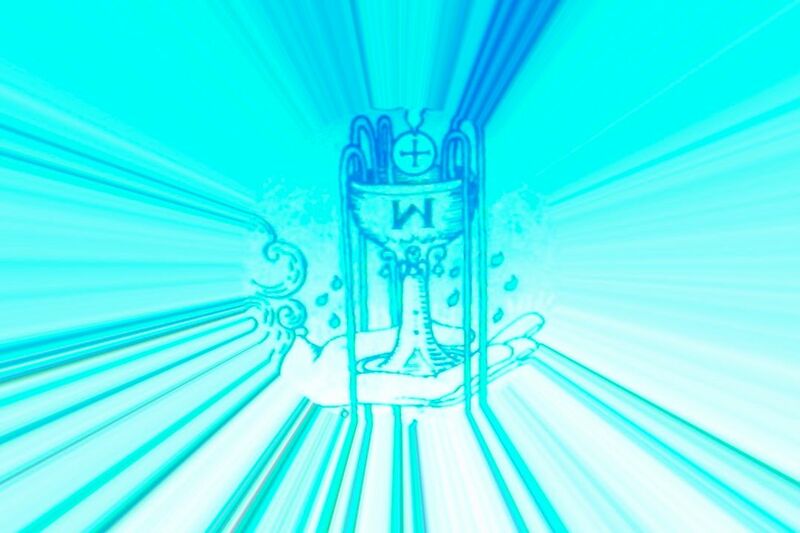 . . the physical world consists of the joining of the opposites symbolized in The Magician and The High Priestess: light and dark, active and receptive, male and female, conscious and unconscious, positive and negative. None of these things can exist without its partner. Just as Earth spins on an axis with north and south poles, so the very molecules of our bodies hold together from the connection of positive and negative subatomic particles. 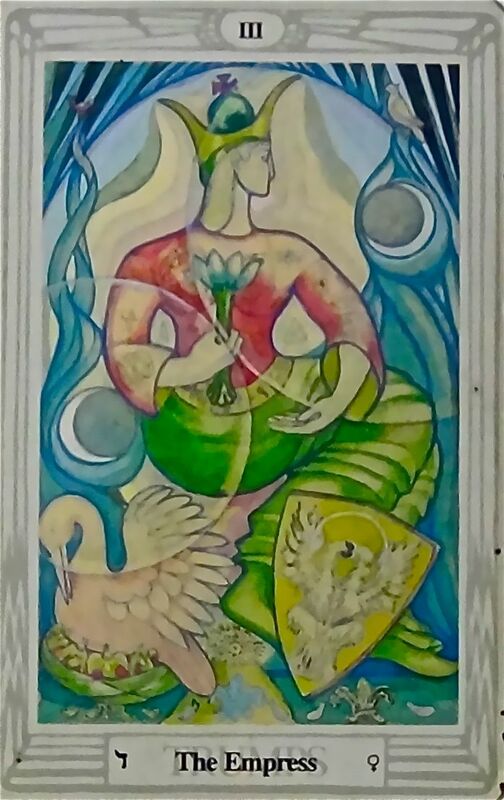 While The Magician and The High Priestess represent principles, the Empress signifies the reality that combines those principles.” [Tarot Wisdom: Spiritual Teachings and Deeper Wisdom/pg. 54]. The Empress is the foundation beneath any creative action. To create anything we need a place both physical in the world and existential. We need support for all the necessary flows of creative action. There is a grand darkness in creation of any kind. A moment of inspiration or intrigue may spark a desire, yet we do not yet see precisely where we are going in an act of creation. A novelist gets a flash of inspiration from an idea for a character, or a vision of a world she wishes to bring to life. Getting through to the end of the story requires the space to not know, to imagine, a place to be safely in the dark. The Empress understands there is no true break between the light and the dark. The Empress is balance. She is love. And Love allows for all that is necessary for the beauty and pain of the creation of art or life or transformation. The Empress accepts all. She embraces the whole easily because she loves life itself, she loves what we can do, what we can make with our own hands and minds and hearts. The Empress will support you in all that you do, she will balance you here on The Terrace as you create your unique expressions and engage The Quest. The Empress is amazed by you, she is the love you give and receive. While The Seer holds the veil between worlds open, The Empress embraces all worlds at once. The Empress is the wisdom of what we call paradox. What occurs to us as opposing forces or points of view, are a singular whole to her. Paradox is a singularity The Empress is wise enough to wrap her arms around as completeness, and patient enough to wait for us to catch on. The Empress loves you, she loves every part of you. Every mistake and every inconsideration, every beautiful creation and every kind word you ever make. The Empress loves you and will always encourage your efforts to become the person you most admire. The body, your physical body, is the boundary between the material field of earth, and the field of infinite cosmological explosions of creation upon creation. That is quite a thing to be. Who and what we really are is quite a thing to be. As you move upon the physical earth, endless messages, endless streams and full fields of information and emotions flow through your brain (your receiver/perceiver). You are a boundary. Or, some will say, The Event Horizon. In whatever manner it suits you to name this reality, certainly a grounding, a balancing in conscious intention is worthy of our time. Breathing deeply, all the way into the stomach is important beyond any words I can use to express it. Several times a day, remind yourself to breathe this way and center yourself squarely on this boundary that is your life, which is expressed as body. Breathe deeply, center. Now, look at a tree and let your mind grasp the first word or image that comes to you. Don’t think, allow. Do this with plants, rocks, and animals who will allow you to catch their eye. Cats are generally pretty into this exercise. Don’t think. Allow. The words, images, feelings you receive are your connection to The All in All. Everything is alive. Everything is conscious. Everything speaks. Learn the languages of everything around you on terms of their own. This is balance. This is knowing. This is access. Learn the languages of beings on their own terms and your body will balance in a constantly exploding, infinite sea of stardust and change. Don’t think. Allow. This is the key to balance. This is the key to living in a body that is only a boundary zone. This is the key to joy and the format of wisdom. For those using these keys for healing work: The Empress is the great hero who can hold all that you are. She is love. She can hold your paradox the way a friend can hold your hat. When you are grieving for those events that have wounded, draw upon the love of The Empress to hold your sorrow in equity with your joy. When you are grieving, joy can feel very far away and that is fine, perfectly fine. The Empress will hold it all for you. The Empress will hold your hope and joy safely while you attend to the pressing matters of your healings. Grief is necessary and, in time, it makes large spaces for the joy which is already ours, though we must seek it from the worst places we have ever been. I love you. The Empress loves you, every part of you. She balances those things that feel confusing to you. Lean on her.